”I discovered another spectacular monthly event. (the plan is first Friday every month) Chef Oscar and staff is presenting suppers representing the indigenous people and foods from before Western influence. This month represented the Mayan culture. Super delicious food and great staff (Flor, Manny, Oscar, etc.) made this a memorable event. I suspect I'll be posting more in the future.” Robert P.
”Chef Oscar's prehistoric dinner was a combination of great food, tasty drinks and cultural enlightenment. It wasn't just an event it was a foodventure! I highly recommend this experience.” Amy B. “Best experience ever in GR.” Jacob D.
“The best fine culinary Mexican cuisine in town.” Fabiola D.
“Last Friday night was the first of three prehispanic dinners. Noche De Tenochtitlan. From the moment we walked in the door We felt a part of something special. My friend Philip and I were part of an intimate group of 20. We enjoyed a 5 course meal in a room downstairs. Chef Oscar put so much thought and consideration into every detail. From the sand under our feet, to the art on the walls and every item on the menu. Such a unique experience. We can’t wait for the next one. The prepared food was from Pre-Columbian Mexico. Food the Aztecs ate before the arrival of Europeans. Where else would you begin a dinner experience by removing your shoes and socks and sitting with your feet in sand? So many textures and flavors. After each course either Anthony, Manny or Chef Oscar would stand in front of us and talk about what was coming next. We learned about the culture of the period. Such a wonderful evening.” Marguerite R.
Chef Oscar has prepared a delicious and unique 5-course prehispanic menu for you to enjoy and learn about the food and culture of the Toltecs. The dinner will feature cocktail pairings to go with each course. 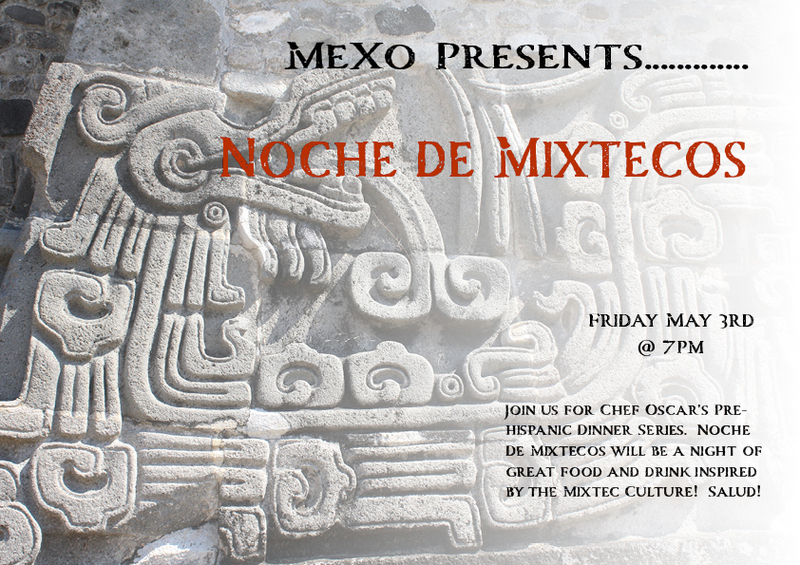 Noche De Tenochtitlan will be a night of great food and drink from Chef Oscar Moreno inspired by Maya culture. Chef Oscar has prepared a delicious and unique 5-course prehispanic menu for you to enjoy and learn about the food and culture of the Mayas. The dinner will feature cocktail pairings to go with each course. To ensure an intimate experience seating/tickets for the dinner are limited. Noche De Tenochtitlan will be a night of great food and drink from Chef Oscar Moreno inspired by Aztec culture. Chef Oscar has prepared a delicious and unique 5-course prehispanic menu for you to enjoy and learn about the food and culture of the Aztecs. The dinner will feature cocktail pairings to go with each course.